If you have a thing for old turntables, but at the same time don’t really have a use for one, it seems silly to keep a real turntable around. Well instead of keeping one around purely because you like the look of them, you could purchase this clock. 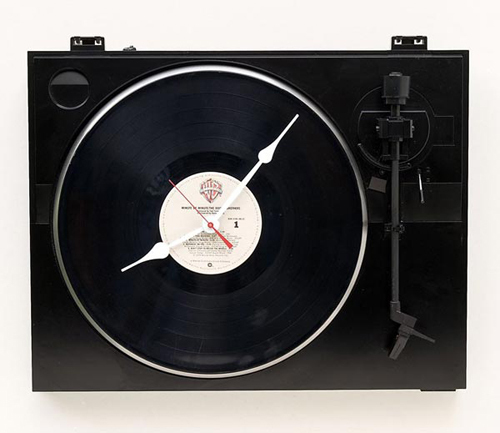 It’s made out of an old turntable, so you get that classic look, but it’s still functional. Plus you can hang it on the wall and you haven’t lost any space on a table top within your home. This turntable is actually a recycled Fishcer turntable and was handmade. The album on the turntable is a Doobie Brothers album, Minute by Minute. To keep the clock up and running all you’ll need is a single AA battery, which happens to be included in the deal. The entire clock measures 17 inches wide and 14 inches tall and hangs from 2 hangers located at the back of the clock. Each model is going to vary slightly since it is made out of an actual turntable, making each one of these unique. You can purchase your own for $89 from the seller Pixelthis within Etsy.